In 2007, the Afghan National Army (ANA) formed its first commando battalion (ANACDO) which is of its structure and training similar to U.S. Army Rangers which later become a part of ANA Commando Brigade. The overall aim was to improve the security situation in the country and create a certain force able to fight against terrorism and insurgency. The project was started under the supervision of US Military and it included various joint training directed by American instructors (mostly from U.S. Army Special Forces – Green Berets). ANACDO basic training lasted for 3 months and it included advanced tactical skills, advanced infantry skills as well as training in combat first aid and tactical management under fire similar to the world’s standard. The American mission there was fully used as train and equip so basically the have taken over complete management of educations and training. First ANA Commando battalions were equipped by US Military standards which ultimately transformed ANA Commandos into an elite military component of Afghanistan security forces which is able and ready to accept everyone into their ranks, including women who are able to undergo rigorous selection training. In next few years, they have overdone dozens of operations and tasks alongside ISAF and American partner forces and gained experience until 2011, when the Afghanistan National Army decided to activate the ANA Special Operations Command (ANASOC). The new special forces headquarters was signed by the Chief of the General Staff in April 2011. The goal was that ANASOC continues to develop and implement its plans for the manning, training, and equipping of its forces, all while simultaneously achieving effects on the battlefield. The development of the ANASOC remains a critical component of the overall force structure and strategy to sustain the transition to Afghan security lead. For NATO and ISAF (coalition forces) creation of ANASOC was considered as a great help for overall security and for the fight against insurgents and terrorists, especially in mountain warfare and on domestic turf (for Afghan soldiers). Upon his creation, the ANASOC HQ in 2011 consisted of 7,809 ANACDO and 646 ANASF (ANA Special Forces). Graduation rates for both ANACDO and ANASF operators remained steady and are on schedule to meet end-strength targets. From October 2011 through March 2012, the ANASOC’s School of Excellence produced a total of 1,817 new CDO and 183 new SF operators. Further development of security issues with insurgency increased the capacity of ANASOC and directed creation of new kandaks (battalions. By 2015 approximately 10,700 military personnel were under the command of ANASOC. ANASOC was grouped into 10 kandaks (battalions) geographically dispersed across Afghanistan. ANA Commandos (ANACDO) are trained to perform all kinds of missions and special operations against hostile forces in all environment. They are trained for urban and guerrilla warfare, combat search and reconnaissance. ANA commandos are also able to deal with hostage-taking situations, but their main goal is to spend every possible moment to help Afghan people, so it is not uncommon to see the members of ANA commandos escorting convoys of humanitarian aid or to see them distributing humanitarian aid directly. They reached ability to conduct independent operations throughout Afghanistan and, when engaged, ANACDO wins decisively. 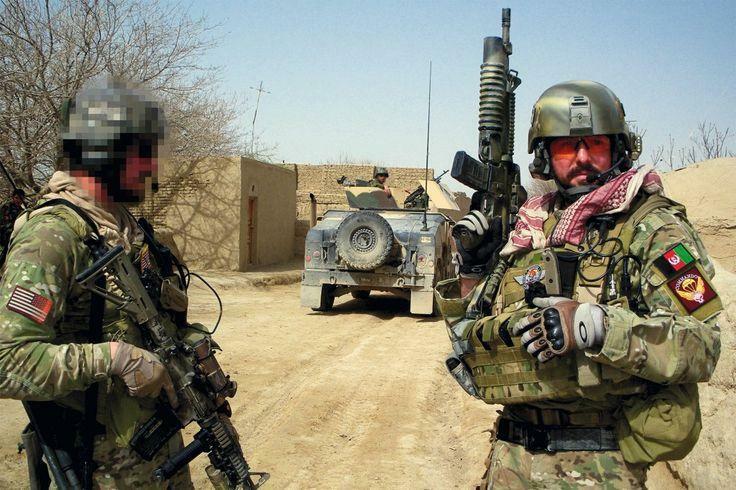 Nearly all special operations kandaks, which includes ANACDO members were conducting independent company-level operations, and several have conducted unilateral missions driven by Afghan intelligence gathered without the involvement of coalition special operations forces. Commando units routinely conducted night raids independently using their own intelligence to drive their operations. ANA Commandos generally use American Humvee as their primary vehicle. The Humvee is known for great mobility and solid protection against personal weapons. They distinguish between other ANA units by their Red Berets. In Portuguese, it is called Centro de Tropas de Operações Especiais (CTOE), and you can translate it to Special Operations Forces Center, they are the Portuguese Army Special Operations Forces (SOF) and are part of the Army Rapid Reaction Brigade. They are based in Lamego, a city in the North of Portugal surround by mountains and very close to the Douro River. The very cold environment in the winter mixed very hot in the summer, the mountain terrain together with the harsh training the men receive is a great recipe to create very tuff Men. Organized in Special Operations Platoons and Task Units (TU), but together with support and logistics, they have a Battalion size unit. The CTOE is composed of a specially selected man, which are organized, trained, equipped and use techniques, tactics and procedures that are nonstandard to regular forces. They are able to conduct activities in all spectrum of warfare, independently or integrated with other regular or irregular forces in a way to achieve victory. In case of Political need they are also able to conduct descript or even covert operations. Special Operations can be conducted directly against an enemy, or indirectly by training and supporting local foreign military or even create militia from populations. Portuguese SOF TU can be infiltrated by air, land or water and coordination with Air, Land and Naval Firepower support is common in any Joint Operations Area as it augments Special Operations capacities. The regular TASK UNIT is composed of Commander (Captain), Operations and Intelligence Officer (Lieutenant), Operations and Intelligence Sargent, Team and Logistics Master Sargent, one support section, one maintenance section, one medical section, one communications section and a Platoon of Special Operations soldiers. Sometimes, if needed, it can be augmented with Air Force Tactical Air Control Party (TACP) personnel. Many other that it´s commander find suitable. Portuguese Army SOF has been deployed worldwide. Some of the known countries are Angola, Mozambique, Guinee-Bissau, Iraq, Bosnia-Herzegovina, Kosovo, East-Timor, Afghanistan, Mali and the Central African Republic. They have been a part of NATO Immediate Reaction Forces since its creation. Portuguese Army SOF has been modernizing itself for the last years. Especially in what concerns the individual soldier equipment. New weaponry like assault rifles, silencers, light and medium machine guns, Trijicon and Schmidt & Bender scopes, AN PEQ-16B laser/illuminator modules, AN PVS-21 night vision goggles, but also protection equipment like the Ops core Helmets, Warrior assault systems Tactical Vests and some day by day items like the mystery ranch backpacks, Harris Radios and Peltor Headsets. Portuguese Army SOF is a modern force with experience in many theatres. With participation in United Nations, European Union and NATO operations, it is a strong asset to these Organizations and its partners. Their motto is: “Que os muitos por sermos poucos não temamos” – Don´t fear the many just because we are few. 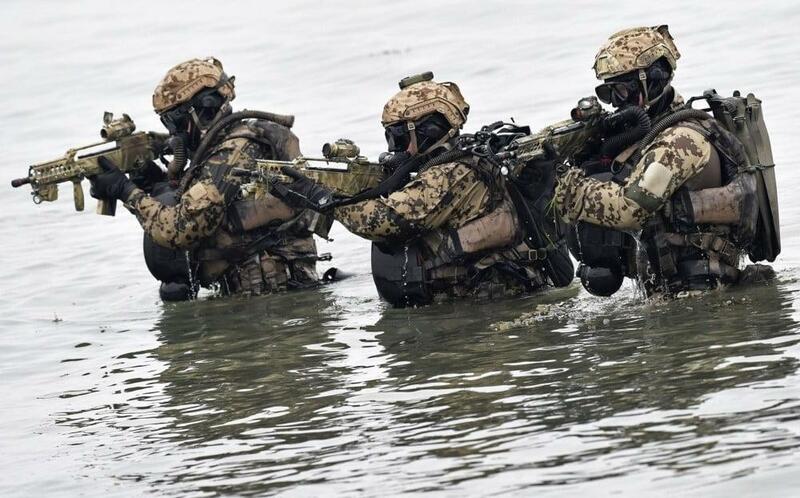 The elite detachment of combat divers, Kommando Spezialkräfte Marine (KSM) is a special unit of commandos of the German Navy that may serve as Berlin’s response the US Navy SEALs. Against the background of the current situation in the world (cold wars, sea piracy, etc. ), KSM acts as an important tool of Germany’s foreign policy. KSM was established for special operations under the water. Special forces in the naval forces of Germany appeared relatively recently. First-ever German military divers were trained in France in 1959. The task of the German battalion “Specialized operational marine forces” (Spezialisierten Einsatzkräften der Marine) included special operations on land and under the water. From 2003 to 2014, the battalion was one of the most sought-after units of the German army. Special operations were conducted in Afghanistan, Cyprus, Lebanon, Kosovo and Somalia. In the process of the recent reorganization of the German Navy, the battalion was divided into several groups. In April 2014, a fundamentally new military organization was created – special forces of commando divers – Kommando Spezialkräfte Marine, or KSM. The Kommando Spezialkräfte Marine is based in the German city of Eckernförd, where the entire fleet of German submarines is deployed. “The new military structure has a narrow specialization, this allows us to better perform the tasks set. Guys do their work professionally, and it is the most important thing for me,” the commander of KSM, Jorg Buddenbaum, said. The tasks of Kommando Spezialkräfte Marine (KSM) special forces include reconnaissance and sabotage activities on the water, under the water, and in the coastal zone. Missions can also be life-saving, peacekeeping, aimed at protecting and ensuring security of any objects (ships, oil and gas offshore platforms). The work of the unit is often conducted under the aegis of NATO or the UN. Each mission usually involves four or five military divers – a commander, a sniper, a medic, a radio operator and an observer. Their diving equipment includes German rebreather Dräger LAR-V, dry and wet suits from 5 to 7 mm, fins and masks, navigation gadgets, knives, underwater watch and underwater pistol P11 Heckler&Koch (silently fires steel arrows). KSM divers use submarine scooters to move underwater, while air cushions, speedboats, kayaks, etc. are used on the water surface. The German Armed Forces do not disclose any information on the number of KSM soldiers. According to various reports, it goes about 130 men (only men can serve in KSM). KSM candidates have to undergo an exceptionally intense 3-year training course. In the process of training, candidates master the knowledge and skills necessary for naval commandos: diving, parachute jumping, rock climbing, counter-terrorism training, boat and ship navigation. As a rule, only 30 percent of candidates join the rank of KSM servicemen. 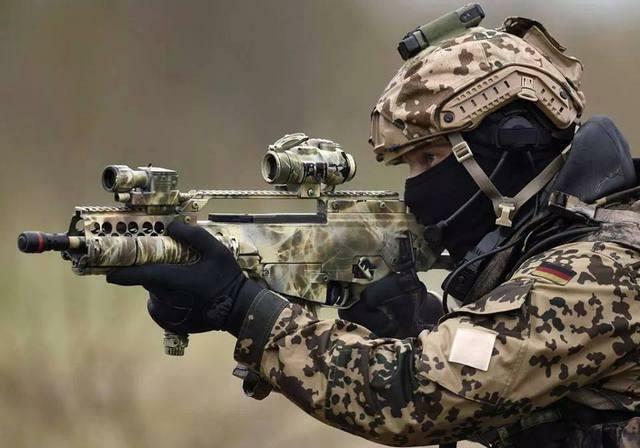 To date, KSM is considered one of the most highly trained special units of the German army.